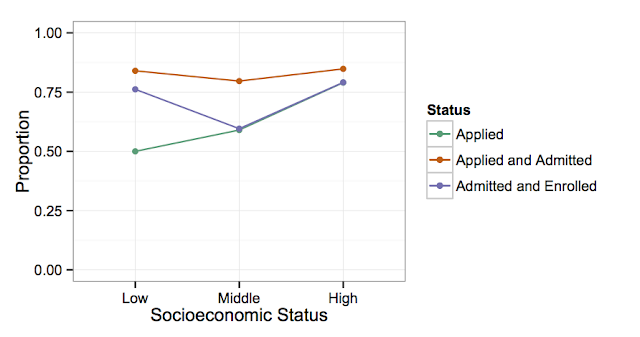 There was an interesting post over at Sociological Images about the relationship between socioeconomic status and high school students likelihood of even applying to highly selective colleges. They applied to at least one highly selective school. They were accepted to at least one highly selective school. They enrolled in a highly selective school. Radford attributes the large gap between High SES valedictorians and Middle and Low SES valedictorians to reduced familiarity with highly selective schools as institutions and their admissions process. That seems to ring true to me, but I was curious how SES affects each step in this process. The graph above doesn't really tell you what proportion of Low SES students who actually applied to highly selective schools were admitted, or at least I don't believe it does. It says 42% of Low SES valedictorians were admitted to a highly selective school, but you have to apply to be admitted, and only 50% of Low SES valedictorians applied in the first place. 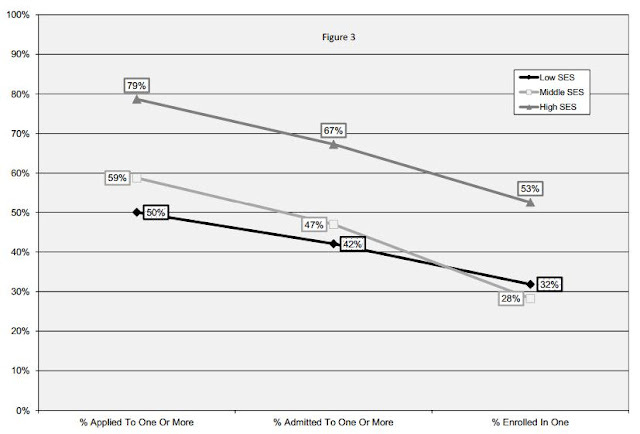 That means that 42%/50% = 84% of Low SES students who applied were admitted. The same goes for enrollment. 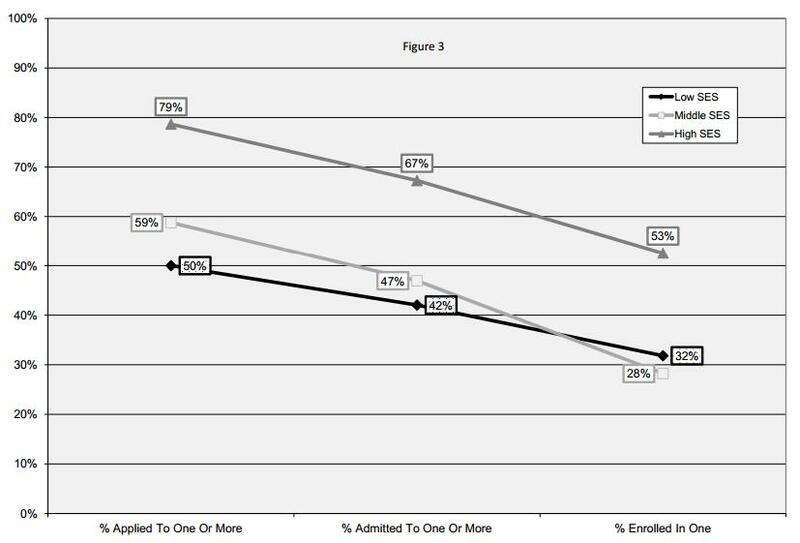 You have to be admitted to be enrolled, meaning the 32%/42%=76% of Low SES students who were admitted to a highly selective school also enrolled. Here's a rejiggered plot I made based on the data in the plot above. 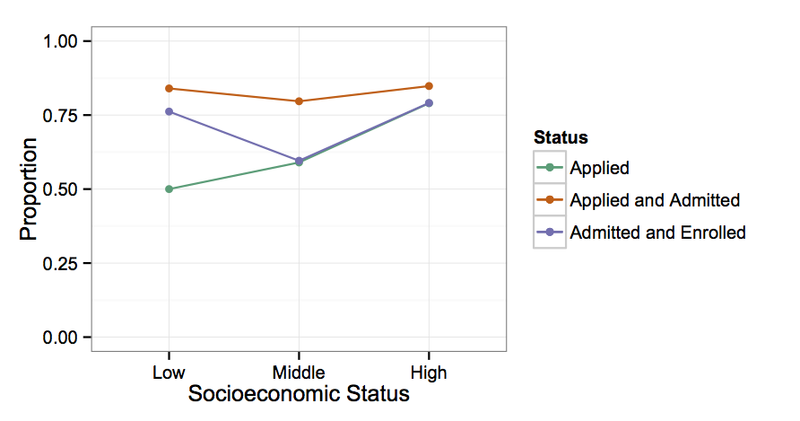 So, it looks like to highly selective colleges' credit, the proportion of high school valedictorians who sent in applications who were then admitted is just about flat across the socioeconomic scale. 85% of High SES valedictorians who applied were admitted, and 84% of Low SES valedictorians who applied were admitted. Things look really different for enrollment though. High and Low SES students have very similar enrollment yield, (79% and 76%, respectively), but Middle SES students have much lower enrollment yield (59.6%). I can only speculate why Middle SES students have such a lower enrollment yield than Low and High SES students. One possibility is that their family's income is just a little bit too high to qualify for needs-based scholarships. Another might be that the perceived cost-benefit ratio for Middle SES students is higher than for Low SES students. However, I think this plot lends credence to Radford's hypothesis that reduced information and familiarity leads to reduced Low SES application rates. For Low SES valedictorians, their application rates are totally disproportionate to the probability that they will be accepted to the highly selective schools, and to the probability that they will actually attend those schools if they are accepted. Update: I meant to include the R code for the data and plot. Of course, admission is not even half or a quarter of the battle. I don't know much about the The High School Valedictorian Project mentioned in the study, but I hope they keep tabs on the Low SES students admitted to the highly selective schools. I know the culture shock I experienced going from a good diocesan high school to an Ivy League university was pretty huge, but I don't know if it was disproportionately huge than it would have been going from any old high school to any old college, or what effect it might have on academic performance. This week, the Boy Scouts of America's National Council will be meeting to vote on whether the Boy Scouts should include the following statement in its membership policy for youths. "No youth may be denied membership in the Boy Scouts of America on the basis of sexual orientation or preference alone." I thought I would take a brief moment to publicly state my support for a more inclusive scouting, and one that will hopefully eventually welcome gay and lesbian adult leaders, and non-religious youths and leaders. I am bothering to speak out about inclusive scouting because I believe that scouting is an over all positive experience that has great value for the youths involved in it. 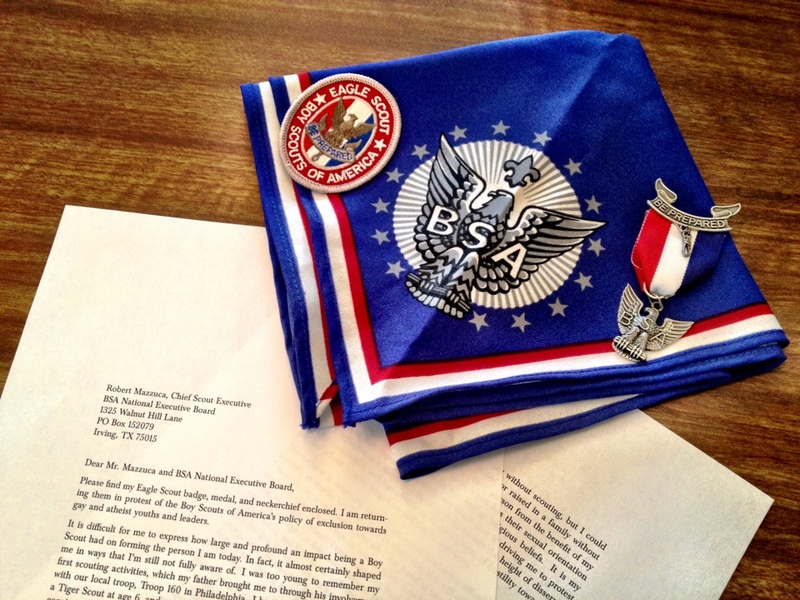 I outlined some of the benefits I felt that scouting had brought to my life in the letter I enclosed with my Eagle Scout award when I returned it in protest of BSA's exclusionary policies. For example, it was in the scouts that I had my first experiences with organizing with peers to reach a goal. The skills I learned there, like learning how to clearly express my vision of what should be done, how to set aside that vision in favor of ideas offered by others, and how to delegate responsibilities have been invaluable for me in my professional life. I also learned the value of living a life of principle, which is why I'm writing this blog post. I was also able to bond with my father, who is also an Eagle Scout, and my brother. I don't believe that there is any good reason to deny any youth or parent any of these experiences on the basis of their sexual orientation, gender identity, or metaphysical beliefs. On this specific issue, I would like to preempt most objections to allowing gay youths into the scouts by coming back to the supreme court ruling that BSA won. The most most common concern I've heard voiced about allowing gay youths into the scouts revolves around who will sleep in which tent on a camping trip. Second and third most common are the discomfort other youths and sponsoring organizations may have with gay youths being in their troop. But the majority opinion in Boy Scouts of America v. Dale made no mention of the logistics of sleeping arrangements, nor discomfort of individuals or sponsoring organizations when they decided that BSA has constitutional right to exclude gay youths. Rather, it was argued that the Boy Scouts of America had an expressive policy condemning homosexuality, that the Boy Scouts "teach that homosexual conduct is not morally straight." The constitutional right to free association that BSA won was not won on the basis of something so trivial as how tricky sleeping arrangements will be, but rather by arguing that they have a core expressive policy that being gay is wrong. When voting on whether to adopt the new membership policy, I hope that National Council members have in mind that they are voting on the principle of whether or not being gay is wrong, and that other logistical concerns are secondary. Regarding those logistical concerns I would just briefly say that the concern I have about openly gay youths in shared tents is the real threat of violence towards the gay youths. That is the reality we are living in. Scoutmasters will have to emphasize to their troops that violence towards each other is not ok, and that we should have to treat all people with human decency, a value I should hope is well within the expressive mission of BSA. As for the discomfort of youths and sponsoring organizations at having gay youths in their troops, I would just say that one of the most valuable experiences I had in the scouts was being in a troop with some people who I would have rather not have been. Not any class of people, mind you, just individuals who at first brush I probably wouldn't have volunteered to be friends with. We don't get to choose who lives in the world with us, but we have to live and work with them every day, and hopefully we can also learn to see the value in them. I would say it is doubly important for youths brought up with religious beliefs that strongly condemn gays and lesbians to be friends with and work with gays and lesbians their own age. They are growing up in a world where gays and lesbians (fortunately) feel more comfortable being out about their orientation, and they will be forced to reconcile their religious beliefs with the fact that they will have gay and lesbian peers as adults, and they will have to do so with grace and aplomb. I know that I haven't addressed all of the concerns people have raised about allowing gays into the Boy Scouts. For example, some people have had fairly vile things to say about gays and pedophiles which I won't bother myself with here. And I won't bother myself with any other arguments either, since most of them seem to have the property that once you provide a counter argument, a new argument can be freely generated. I think this is because these concerns about camping in tents and so on are transparently secondary to the core contention about whether being gay is wrong, a proposition which has become impolite to say itself. Hopefully, the National Council adopts the new membership policy.